The White House’s proposal to privatize the U.S. Postal Service is unlikely to find much traction in Congress, with lawmakers on both sides of the aisle criticizing the suggested fundamental overhaul of the mailing agency. Lawmakers across the ideological spectrum who have expressed an interest in postal issues showed little interest in Trump’s transformation, defending the Postal Service as an essential government service. They pointed instead to reform proposals they have themselves put forward and refined after years of tense negotiations among an array of stakeholders. The proposal came in President Trump’s plan to reorganize the federal government. It followed an executive order Trump issued in April, creating a task force to recommend a path to put the cash-strapped agency on firmer financial footing. The reorganization plan preempted that process, however, as the task force is currently meeting with stakeholders and plans to issue a report by Aug. 10. The White House suggested the Postal Service institute those recommendations to get itself into better shape before it is sold off to the private sector. Cummings’ bill, as well as a similar measure in the Senate, would shore up USPS’ finances in large part by shedding many of its obligations, including shifting most retirees to Medicare for their health coverage. Those measures would aim to expand postal services, however, and firmly keep the agency in place as a government entity. 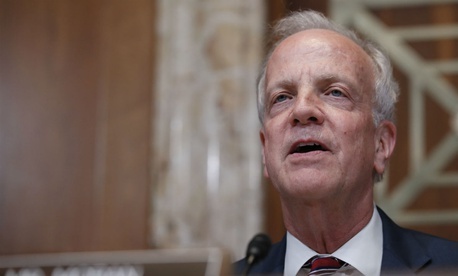 A spokesman for Sen. Jerry Moran, R-Kan., who cosponsored the Senate bill, pointed to a letter the senator wrote to the Trump administration imploring it to maintain and strengthen a public postal agency. In it, Moran called the 2018 Postal Service Reform Act a “finely tuned piece of legislation” and suggested Treasury Secretary Steven Mnuchin, who is heading up Trump’s postal task force, use it as a “blueprint for your work.” Rather than pushing USPS to the private sector, Moran said the agency should grow and expand its offerings. “The Postal Service can only find its way out of its current financial situation with more and better quality service,” Moran said. He suggested maintaining mandatory six-day delivery and keeping the current level post offices and mail processing facilities. Sen. Tom Carper, D-Del., who wrote the bill Moran lent his name to, pushed his legislation and said Trump’s proposal was dead on arrival. Postal employee unions and coalitions representing large-scale mailers have similarly denounced the White House's proposal. “Ultimately, it will be for Congress to decide whether the best path to financial sustainability is to preserve the Postal Service status as a government institution focused on our mission of public service, while giving us more authority to meet our responsibilities, or whether a profit-maximizing corporate model is preferable,” Brennan said.